Now that the iPad has arrived and the subject of various reviews and opinions, I stopped by the local Apple store and had a quick look and experienced Apple's latest product. After few minutes and an effective introduction to the unit by one of Apple's gurus, I came to the conclusion that it is an attractive and a well designed computing appliance; an excellent industrial design example as expected from Apple: simple, intuitive, elegant; however, it is not for me. The design, ergonomics, look, touch & feel exhibit the Apple-esque experience, the expected result of a contemporary product of Steve Jobs and his design and engineering teams. Working with the unit and asking myself whether it could replace my mobile computing and communications tool, an Apple product, a MacBookPro. The answer is no; certainly I do not need to carry yet another unit in addition to a phone and a laptop. However, the designed target for the iPad may include casual Internet browsing, e-mail, and media player for e-books, e-newspapers, e-magazines, video, pictures, games, etc. Other more serious use cases may find the iPad as the tool for applications where conventional laptops, smart phones and similar units are too big or too small and generally inadequate and the tablet format may be a good fit and indeed useful such as in manufacturing, health, labs, transportation, construction, education, science, police, customs, field work, mobile point-of-sale unit in retail and other industries, GPS-based and compass guiding tour unit at museums, theme parks, golf courses, factories, universities, cities, etc. With the introduction of the iPad, Steve Jobs' list of industrial designs and computing contributions may include the reintroduction of the tablet as a computer form factor with design characteristics for it to be applicable in several areas including applications where paper is predominately used thus commencing the ever expected en masse transition to electronic media and the volume use of tablets and iPad-like devices, such as Google's expected Chrome-based tablet, may finally be effective, efficient and conventional computing appliance used where newspapers, books, magazines, maps, specifications, reference and training documents, and paper forms are used today. For this transition to materialize, the price must come down to less than half and towards $100 dollars, and the unit, applications and application development and licensing, improved and without requiring application registration and vendor approval, fostering an open and federated rather than a closed and centralized application ecosystem, for tablets, laptops, smart phones and other communications and computing devices to find en masse use as media and application players and significantly reducing the need for paper. 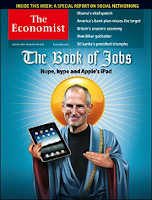 This article How the Tablet will Change the World is an interesting read. Hopefully someone else will be making the devices, we do the software. What's important now is to get the mobile architecture right. Because mobility will be the way you will provision in the future. Fast forward 5-10 years. The answer should always be mobile first. You want to have the best app on mobile....The promise of Chrome and Chrome OS is that the devices you give to employees will have 2-second boot time, will be disposable, low price.